Comments - Handsome kabuki portrait of a young nobleman looking over his shoulder with a sad expression, frowning as he looks off into the distance. 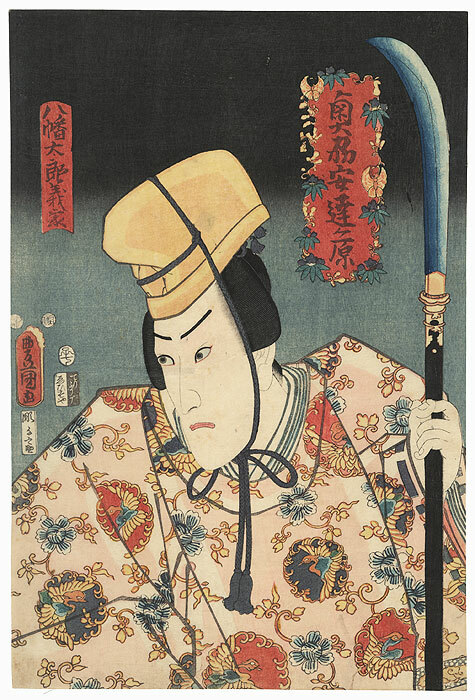 He grips a naginata in one hand, dressed in a formal robe patterned with bird motifs, blossoms, and yellow vines, a yellow court cap tied under his chin with a tasseled cord. The red title cartouche at upper right is framed with paulownia, tiny gourds, and butterflies. A fine, moving figure set against a softly shaded night sky. Image Size - 14 1/8" x 9 1/2"
Condition - This print with excellent color and detail as shown. Paper remnant on reverse from previous backing. A couple small holes, repaired. Slight toning and soiling, a few creases and marks. Please see photos for details.